This is the second in a series of five posts to describe how managers can coach people to practice genuine collaboration in the workplace. 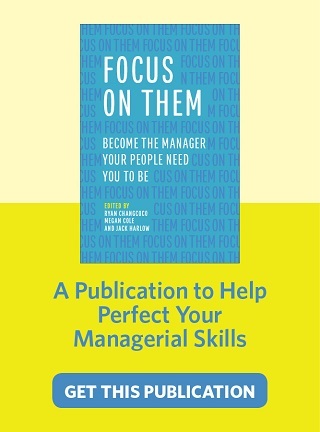 These posts represent excerpts from the Association for Talent Development’s new book, Focus on Them, scheduled for publication in December 2018 by ATD Press. Winsor Jenkins is a contributing author of the book. In my first post, we established a road map described as a Team Mini-Charter for Developing a Culture of Collaboration—along with understanding the significance of an operating platform to support your team’s ability to lead with mindset and produce outstanding team results. Focus on Team—Not Position: Address the need to focus on results produced when all positions effectively interact on the business field. Understand That Everyone Can Play: Recognize that technology is the great enabler allowing people everywhere to play—to collaborate—in business. Embrace Diversity: This is the prerequisite for partnering in global business, and serves as a springboard for establishing trust. Diversity brings strength to teams. Rely on Each Other: Reinforce the team orientation and minimize the silo mindset, to recognize a mutual dependency between people and promote genuine collaboration. Promote Both Individual and Team Values: Manage both values in a never-ending cycle to help ensure that the process for producing team results is working. Seek Skillful, Adaptable Players: Promote the need for flexibility for managing change. This requires people and teams who can quickly assimilate and use new skills and information and the like, and recognizes that multiple skills are needed to play the game of business. Charge the Team to Perform the Work: Recognize the self-directed nature of the team charged with performing the work; recognize that the team’s performance during the game (business) is left up to the team. Empower Players to Win: Commit to develop all employees, and to provide continuous feedback—all to help position people to make better decisions. Coach Teams to Respond to Changing Conditions on Their Own: Reinforce the application of a real team, self-directed, operating on a real-time basis, responding to changing conditions. Develop Partners on the Field: Recognize that all players on the business field are viewed as leaders. View every opportunity as a leadership development step. Achieve Cross-Cultural Agility: Leverage relationships in business to achieve results, transcending technique in dealing with people across cultures. Your coaching starts with sharing these principles with people on your team and finding every opportunity to reinforce their understanding. Because they serve as governing principles that support the actions of people on the team, it will take repetition and practice to learn and embed them inside the team—versus just understanding, agreeing with, or appreciating them. One option for developing these principles is to consider using a training program like The Collaboration Game. Once your team’s understanding of these principles is firmly in place, your next coaching assignment is to convince the team that these principles must be embedded in the team’s charter. This means spending adequate time exploring, shaping, and agreeing on a charter your team takes ownership in, both individually and collectively. This may be your key coaching challenge and one that requires your commitment to provide ongoing oversight and coaching. Your coaching may also include dealing with people who show up believing that collaboration means group work—their attitude is “let’s just cooperate/coordinate.” If this is the case, your coaching challenge is to get people on your team to understand that high performance is needed for the task at hand—and that it can be achieved only when they function in a way that recognizes the interdependent nature of the team’s relationship. Anything short of that understanding would mean that people on the team are not practicing genuine team collaboration. If your team is described as an intact team, high performance, as such, may not be needed for each task the team is working on. If that’s the case, then the team may function in a way that does not recognize the interdependent nature of the team’s relationship. That means collaboration should not be practiced as a default mode by your team for all tasks; its application is task-specific. As the team’s manager, this is not so much a coaching opportunity, but rather a management application you will have to address, when necessary. For project teams, high performance is the likely operational mode. As team manager, you’re charged with the task of creating a collaborative culture inside your team. Your people will need to be coached on collaboration’s operating principles to fully leverage the team’s time and energy.